At wharf gate (AWG) prices for NZ logs increased by an average of $2 per cubic metre in March. 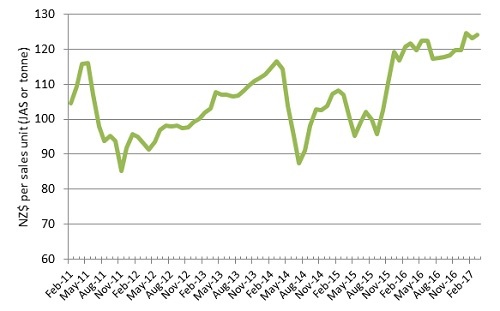 As reported in the February Wood Matters the export markets have been very stable, and total stocks in China have reduced slightly to 3.5M cubic metres. There is strong demand for quality pruned logs and larger saw logs of A (30cm small end diameter) and AO. These logs are used in the furniture, plywood, and construction markets. The smaller K logs (22cm small end diameter) for the plywood market are stable, as are the rougher KI logs for the construction sector. The smaller KIS logs are becoming price sensitive in China when compared with the local poplar logs. We expect AWG prices for logs at NZ ports to decrease slightly in April due to increased shipping rates. The CFR sale price in overseas markets is not expected to change much to compensate for the shipping increase. The weakening NZD relative to the USD from a mid-February 0.717 to mid-March of 0.692 will partly offset the freight effect. Where AWG prices end up will depend upon how the log buyers fare in shipping negotiations and currency management. With the export and domestic markets being relatively stable I will focus this column on what will likely have the biggest impact on log prices over the next few months; namely the ocean freight costs. Exporters are anticipating increases in shipping rates to China of between $3-$6US per JAS m3 over the next couple of months. Port congestion in China leading to lower vessel availability. (Which is difficult to fathom when you observe how many ports they have). Increased demand for vessels from a good grain harvest in Australia. Increased freight demand due to China importing more coal and iron ore. The Chinese government is reducing the number of coal and iron ore mines in China and restricting production to combat pollution as well as inferior quality issues. This means they are importing more of this material. Freight-mile demand has also been boosted as some of this commodity comes from South America. Global steel production continues its recovery in 2017. In January Indonesia removed its ban on the export of metal ore and mineral concentrates. Analysts estimate that one company Antam alone has a stockpile of 20Mt of nickel ore, which is now available for export. Dry bulk shipping stocks surged in the aftermath of the Trump election win and the Baltic Dry Index (BDI) crossed the 1,000 point threshold in November 2016 for the first time in 15 months. Many investors held the theory that Trump would stimulate the economy via infrastructure spending, easing regulatory restrictions and revising taxes. This meant investors shifted from risk-off to risk-on positions. While this was mainly on sentiment rather than economics, as interestingly Trump’s proposed policy initiatives were less relevant to the dry bulk carriers than the tanker and container shipping sectors. Is this spike a sign of typical volatility within this industry or are there longer term factors? Industry analysts suggest increasing trade and reducing ocean freight capacity will support a recovery in charter rates on most major dry bulk shipping routes in 2017. The Chinese real estate sector improved in 2016 which led to iron ore trade growth by 5% in 2016. Steel is produced by the use of iron ore, metallurgical (coking) coal, scrap and other minor ores. Any increase in steel production involves a significant amount of vessel activity. The freight demand is further increased if China has to import more raw material for the steel making process. The global steel production in Q4 2016 approached the 2014 levels, and this recovery is forecast to continue through 2017. 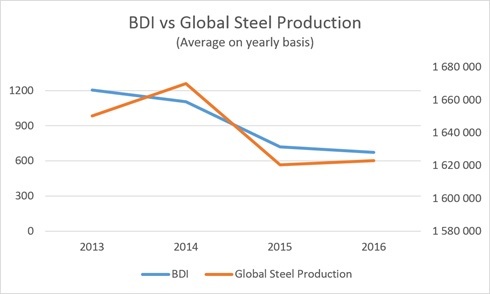 The graph below shows the connection between the BDI and global steel production (of which China is the largest producer). Global GDP growth is forecast to increase from 3.1% in 2016 to 3.4% in 2017. Chinese GPD is predicted to fall to 6.5% in 2017- down from 6.7% in 2016. GDP however, is not a strong predictor of shipping markets. More important will be how much raw products the Chinese have to import due to domestic supply constraints. The minor bulk cargoes (which tend to utilise the same sized vessels as logs) are expected to increase by about 2% in 2017. This is mainly due to an increase in exports of bauxite (a key component in the manufacture of aluminium) and petcoke (Petroleum coke is a solid by-product of the oil refining process), and increased imports of cement due to higher USA demand. The aforementioned Indonesian exports may also increase activity in this segment of the market. Some analysts advise caution in being overly bullish with increased predictions of BDI as the industry has an ongoing and substantial vessel oversupply. (Supply grew at 2.4% while demand only grew at 1% in 2015). Supply is slowing however as 2016 supply growth was 2.2% and 2017 supply growth is expected to be 1-1.5%, as financing tightens and new orders are restrained. The order book for new vessels is sitting at a decade low of 11% of the world’s fleet, which has reduced from about 20% a year ago. The final growth figure will depend upon scrapping decisions. The environmental regulations on Ballast Water Treatment System (BWTS) will take effect in September 2017, and could result in higher scrapping of old tonnages. Some ship owners may prefer to scrap their old tonnage, with low earnings potential, than incur the additional cost of a BWTS. The bunker fuel regulations that are scheduled to come into effect in 2020, will likely have a bigger impact on scrapping rates for older vessels. The current fleet sailing speed is well below the potential, and any sudden increase in demand and charter rates could see speeds increasing. 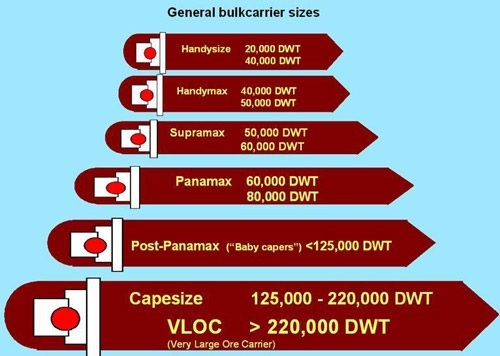 A laden Panamax was consistently travelling at 14 knots from 2000 to 2011 (except for 2009). As freight rates have reduced, ship owners have reduced the speeds of their vessels to reduce costs (which increase exponentially with speed). Due to technical limitations the fleet has been unable to slow to less than 11.3 knots. Klaveness Research indicates the current Panamax speed is 11.4 knots. A supply increase of 16-17% can be achieved just by increasing the average speed to 13.75 knots (assuming 80% of the voyage day are at sea). For this reason many industry analysts say the freight rates will not return to the hay days prior to 2011. Any temporary vessel shortages due to port congestion or exceptional grain harvest. And then there is the unexpected - I recall many years ago there was a drought in Europe which meant the water-cooled nuclear reactors were shut down. This lead to a significant increase in the coal trade, and freight rates increased substantially. A significant increase in vessel scrapping rates would reduce fleet capacity and would likely have a long tem effect. Developments in the Chinese real estate sector (but remember there is an offset here as this affects demand for logs), steel making and coal industries, combined with the Chinese government’s policy on domestic production of raw materials. So while demand for vessels may strengthen in 2017, this demand is rising from a historic low, and supply can expand to meet this for the next couple of years. There will always be temporary fluctuations due to port congestion and the very complex interactions within this industry. Logs from NZ are shipped in Handysize and Handymax bulk carriers. The PF Olsen log price index has risen to $124 in March. The index is now $10 above the 2 year average, $14 above the 3 year average, and $17 above the 5 year average. The March 2017 index is $37 higher than its 6-year low of $87 in July 2014.